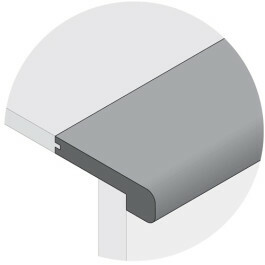 Flush Mount Stair Nosing, also known as Bull Nose, is an essential part of any nail down or glue down installation. It must offer both style and function by absorbing the blunt of foot traffic while offering a stylish transition from wood floors to any drop down. The stair nose gives your wood flooring a rounded edge when leading down towards any stairs, sunken living room, or balcony overlook. Dimensions: 9/16" x 3-1/2" x 48"